For those who love horses and if you don’t love them, this movie will make you love Buck Brannaman, the inspiration for the novel The Horse Whisperer and technical adviser to Robert Redford on the film of the same name. His results with horses, even with the feistiest and most deadly horses, are remarkably successful. 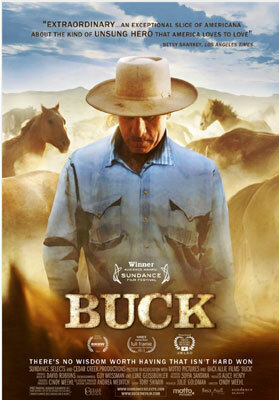 Buck is a soft song of praise to a wrangler psychologist whose gift with horses defies analysis, so unassuming is he, so gentle that he appears not to be working at all. His interaction with humans is just as successful with clinics all over the West to show owners and trainers how to tame the liveliest colts. His loving relationship with his wife and daughter, who performs at rodeos with him, is a testimony to his belief that humans are key to the happiness of the animals.